My ride today took me from Amsterdam to Vlissingen located at the mouth of the Schelde, the most important passageway to Antwerp. 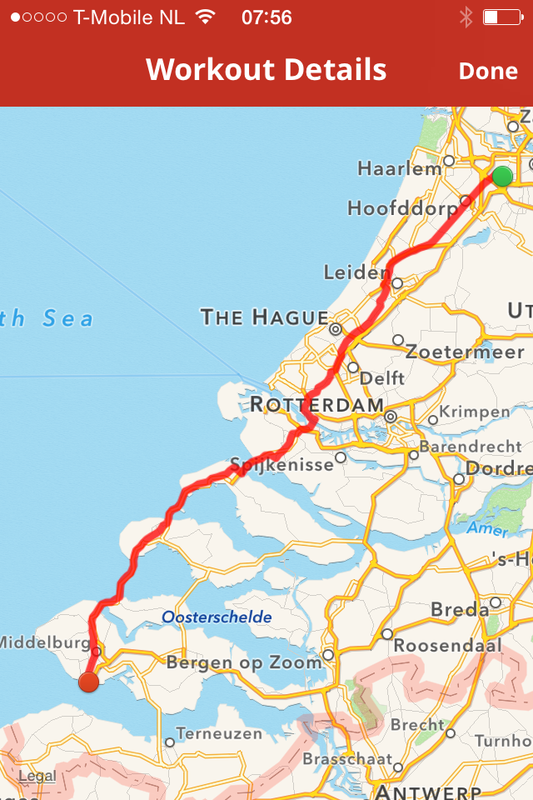 The route I choose to follow took me through Hoofddorp, Leiden, Den Haag to Maassluis, in Maassluis I took a ferry over the river Het Scheur to Rozenburg Island. From Rozenburg Island I crossed a bridge to Voorne-Putten Island and followed the Noordzee Route to Vlissingen. The best part of the ride is when you cross from the island Goeree-Overflakkee biking down the Brouwersdam dam towards the island of Schouwen-Duiveland island. Along the Brouwersdam dam there are several beaches where can stop for a swim, it is also a place for kite surfers and wind surfers gather. There are a few mobile restaurants along Brouwersdam dam to top up your energy levels before the last ride to Vlissingen. From Schouwen-Duiveland island to get to Vlissingen I crossed over the Oosterscheldekering, a storm surge barrier, between the islands Schouwen-Duiveland and Noord-Beveland, it is the largest of the 13 ambitious Delta Works series of dams and storm surge barriers, designed to protect the Netherlands from flooding from the North Sea. To finish in Vlissingen I passed through Middelburg, that is dating back possibly to the late 8th century or early 9th century. The first mention of Middelburg was as one of three fortified towns erected on Walcheren (then an island) to guard against Viking raids. Arrived in Vlissingen after a good bike ride, the weather was in my view perfect for a bike ride, overcast with a slight breeze from NW. To finish up before heading back to Amsterdam by train, I had a meal and beer in a local bar. I checked my distance and I had biked 172 km in 7 hours and 32 minutes.